The Pharma journal have open access policy. Join Pharma Journal Board as Reviewer. 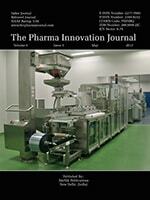 "The Pharma Innovation" is a peer-reviewed journal. The prime focus of the journal is to publish articles related to the current trends in research . This journal provides a platform with the aim of motivating students and personnel in Pharmaceutical and Biomedical Researches and Developments. Its publication frequency is monthly. Pharma Journal covers following Subjects: Medical, Dental, Life Sciences, Pharmacy, Biology and Chemistry which include Pharmaceutical technology, Pharmaceutics, Medical Physiology, Biopharmaceutics, Pharmacokinetics, Pharmaceutical chemistry, Medicinal chemistry, Analytical chemistry, Pharmaceutical analysis, Cancer biology, Botany, Zoology, Biotechnology, Molecular biology, Cell biology, Genomics and Proteomics, Microbiology, Immunology, Computational chemistry, Organic chemistry, Inorganic chemistry, Biochemistry, Physical chemistry, QSAR, Pharmacognosy and Phytochemistry, Pharmacology, Pharmacy practice, Hospital and Clinical pharmacy, Pharmaceutical Biotechnology, Pharmacogenomics and Bioinformatics. The Pharma Journal is Indexed and Abstracted in following Database(s).